Show management companies hold a lot of responsibility. It is the job of the show manager to help their clients meet their business goals, which means that they have to carefully plan and coordinate entire trade shows to ensure that those goals are met. Trade show managers are typically responsible for doing show research, analyzing the site, planning the trade show booth, managing the expenses and ensuring that they meet the client’s budget, promoting the show and analyzing the ROI of the show. That’s a lot to have on your plate, which is why you should outsource some of your tasks using our event managing services at Jacoby Expo in order to make sure the event runs as smoothly as possible. Why Outsource to Jacoby Expo? Custom booth design – You’ll probably have a good idea of how you want your client’s booth to be set up having done the required research on the target audience and the event site; however, we can still help to customize the booth in a way that best reflects the intention of your client’s brand and that will be as effective as possible at attracting show attendants. Not to mention that we will save you time by installing the booth and breaking it down at the end of the show while you focus on more important matters. Storage and logistics – Coordinate with us on when you want the show materials to be delivered to the booth and how you want them to be stored and what the client’s budget is. Not only will we plan and coordinate how materials are shipped and when they are shipped to ensure that they arrive on time, but we will help set them up at the client’s booth. We will keep the empty containers out of the way throughout the duration of the show, then repack all of the materials and ship them back out. We can do all of this while seeking out the most competitive shipping prices available. Floor managers – We can provide you with additional floor managers if you need the extra staff. Our floor managers can provide the most basic services, from providing customer service and checking in with your team to keep you up-to-date to monitoring security and enforcing the show’s rules and regulations. 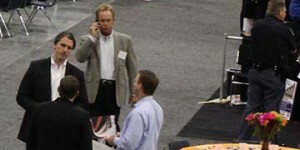 Our floor managers will act as a liaison between your show managers and the exhibitors, labor and facilities. We’ll even keep an eye on the progress of the exhibitors to ensure that everyone is adhering to your production schedule. Post show information – We can make it easier to analyze the ROI of the show by providing detailed equipment reports, exhibitor order reports and management invoice reports. As you can see, our Jacoby Expo services, which range from setting up the booth to managing the trade show floor, can be of great help to trade show managers. Ready to schedule a consultation? Need answers to some questions? We are happy to help!